TIBIAL FRACTURE | GEORGE D. GOUDELIS MD. Ph.D. 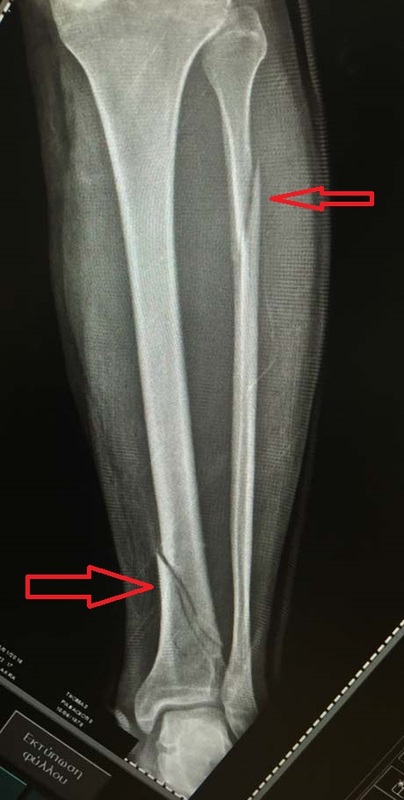 The fracture of the tibia bone is a frequent injury in the usually young ages. It can occur either during sports - football, whether in a motor-vehicle accident. The tibia is located immediately under the skin therefore often can protrude from the wound (open tibial fracture). 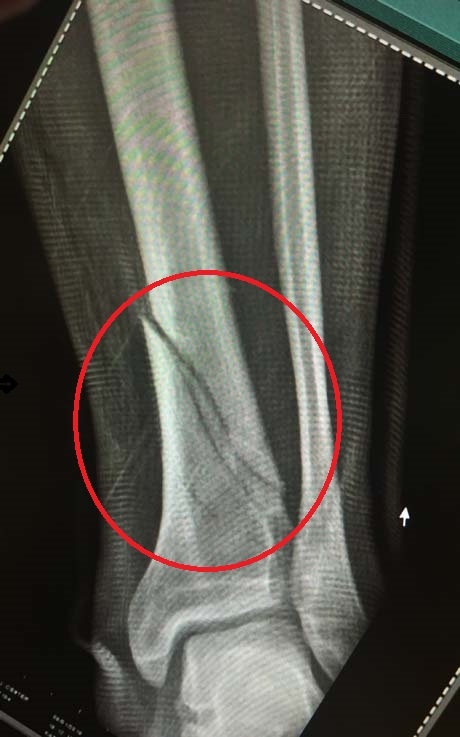 The treatment of the fracture must be made directly with immobilization of the affected limb and the patient must be transferred directly to orthopedic clinic and treated surgically. Today there modern surgical treatment methods which allow immediate mobilization of the patient and sometimes the direct full weight bearing of the affected leg. This contributed significantly to faster return of the person in its activities with the least possible psychological attributing that cause this injury. 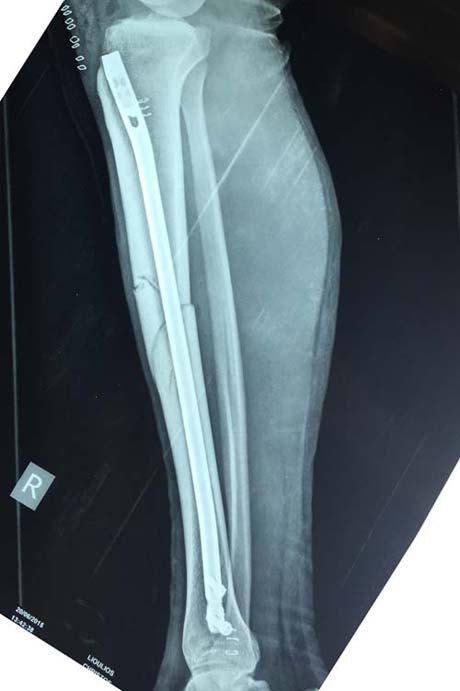 Patient of 20 years after a road accident (passenger motorcycle) underwent closed non-displaced fracture in the diaphysis of the tibia. In preoperative radiograph seeing disorder of the mechanical axis of the lower limb and the anatomical axis of the affected tibia. The patient underwent surgery, intramedullary nailing of tibia with titanium nail and stabilization with titanium screws to the edges of the nail (intramedullary nailing with reaming). The young patient a few hours after surgery got up and walked with almost full weight bearing of the operated lower limb at the beginning with assistant of the crutches. 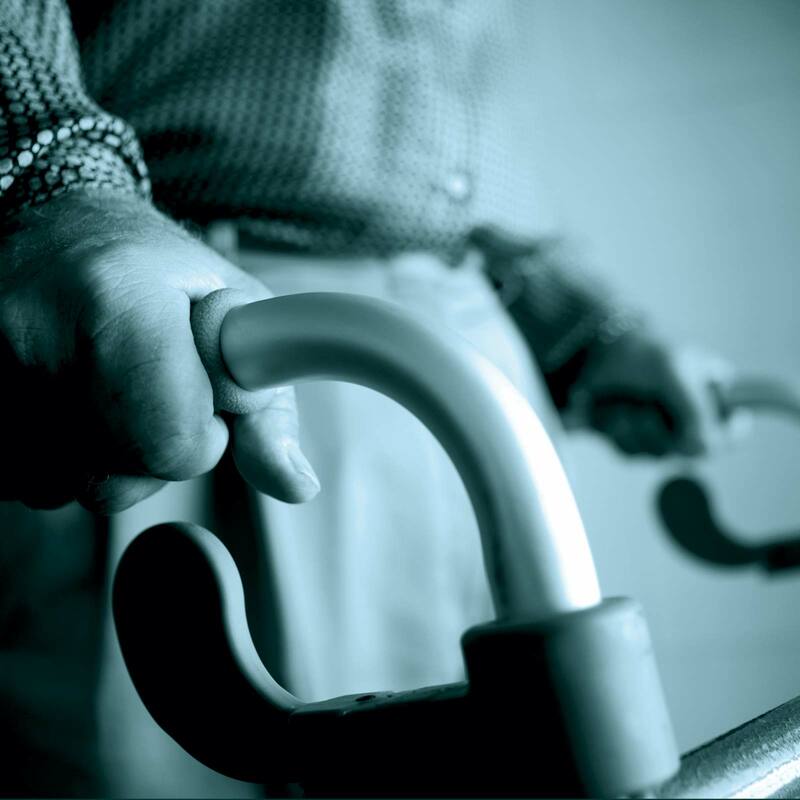 In 20 days, walking was independent aids (crutches) and without any pain. 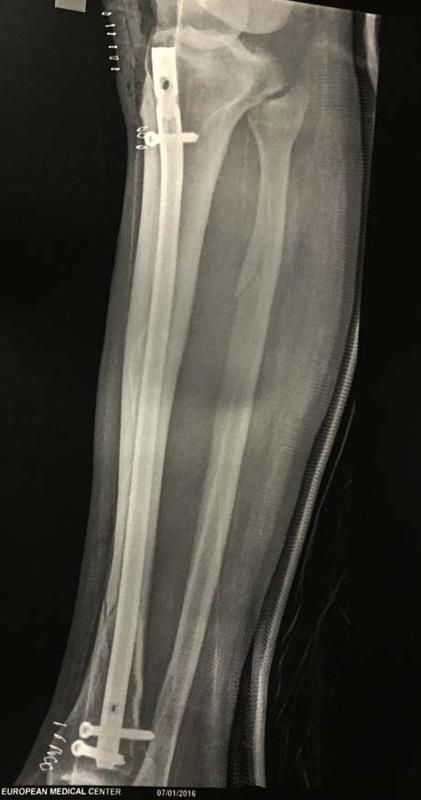 Patient because the fracture is quite peripheral and involves the metaphysis of the tibia, the weight bearing of the limb did 20 days after surgery.